Syntheselen™ is an Adenosine Triphosphate (ATP) and Uridine Triphosphate based sterile preparation manufactured by a pharmaceutical company in accordance with the highest level of manufacturing practices. 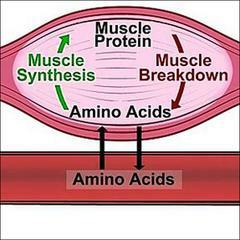 The focus of this article will center on energy (ATP) and its relationship to protein synthesis. By necessity we will keep the specifics of operations at molecular level to a minimum. What has long been known? It has been established for some time now that both muscle protein synthesis 1-4 and muscle protein degradation are stimulated by resistance exercise2-4. Traditionally the overall net effect (synthesis – degradation = + or –) has been understood to depend on what happens in the post exercise environment. In that environment protein degradation is brought to an end if carbohydrates are ingested following resistance exercise while net protein synthesis (i.e. protein synthesis exceeds protein degradation) is achieved only if both carbohydrates and protein are ingested following the resistance exercise session 5-10. These concepts are so well established as evidenced by the numerous references cited herein that it is barely worth mentioning.